As Sigmund Freud notes, while our possibilities of happiness are already restricted by our constitution, unhappiness is much less difficult to experience. “We are threatened with suffering from three directions,” he concludes, “from our own body, which is doomed to decay and dissolution and which cannot even do without pain and anxiety as warning signals; from the external world, which may rage against us with overwhelming and merciless forces of destruction; and finally from our relations to other men”. In his late writings, Freud thus comes to insist that both the individual psyche as well as culture in general are as informed by a drive towards death as they are by a desire to pursue happiness. If, then, the fragility of quotidian human life and our propensity towards unhappiness emerge most poignantly in moments when death actually occurs, this is also a solitary, highly individual and incommunicable event, an experience of utmost intimacy. At the moment of one’s dying, one is alone. While death is generally acknowledged as the one certainty we have in life, as the one unequivocal measure of human existence, it is impossible to say with certainty when it will occur. No one can know in advance what death will be like, even while the actual event of death eludes all knowledge of the survivors. All that can be said about death is that it entails an irrevocable fissure, a break with the ordinary everyday, with its language, its structures and rules. For the mourners, the event of death produces a crisis in the quotidian one might call an undoing of world. In Eija-Liisa Ahtila’s film Today, the death of a father is recounted in three parts. The first shows his granddaughter, throwing her ball in the backyard of her home, emotionally detached from the terrible event. She can grasp death, which is nothing to her, only through the effects it has produced in others, such as the excessive crying of her father, who normally never cries. The second part, allegedly more concerned with the daughter Vera’s cultural malaise, briefly includes a few seconds of the fatal nocturnal drive through the woods, an ominous trace of something that has occurred, but which can neither be clearly named nor located. Not until the third part, entitled “Dad,” do we finally see the father, silently walking along a path in the woods and then lying down there. This part is staged far less realistically than the other two, as though it were a hallucination. The self-consciously artificial lighting of the scene prompts us to ask, who is telling this part of the story. Has the specter of a dead man returned to enact his death for us? But if so, the revenant can do so only in the form of a dumb show,and only byway of setting the stage for a death he anticipates. We are watching a scene,which allows us to expect death, not the actual event, even if we are doing so after knowing that it has occurred. The cinematic medium allows us to simultaneously partake of this death before and after it has happened, but there are no images for the event itself. At the same time, we might also ask whether this surreal scene isn’t the son’s fantasy, given that the narrative shifts to him, as, getting up from his bed, he recalls the idiosyncratic behavior of his father. Only after this account does he offer his version of the fatal drive through the nocturnal woods he took with his family, because they wanted to go for a swim. The unreality of the scene is heightened by the words he chooses to describe the accident. He remembers pointing out to the others the black shadows of the trees, striping the road,until suddenly one of those shadows stood up, “and then, again, an accident happened.” If we recall that the Dead in Hades were called Shades by the authors of antiquity, we might speculate that Dad is a Shade from the underworld, returned to haunt the living, before he is a corpse. Indeed, we might wager, he is dead because he was a shadow,who suddenly stood up.We see the glaring white light of the headlights and hear the screeching of the tires. But Dad, alive in this recollection of his death, remains completely elusive. 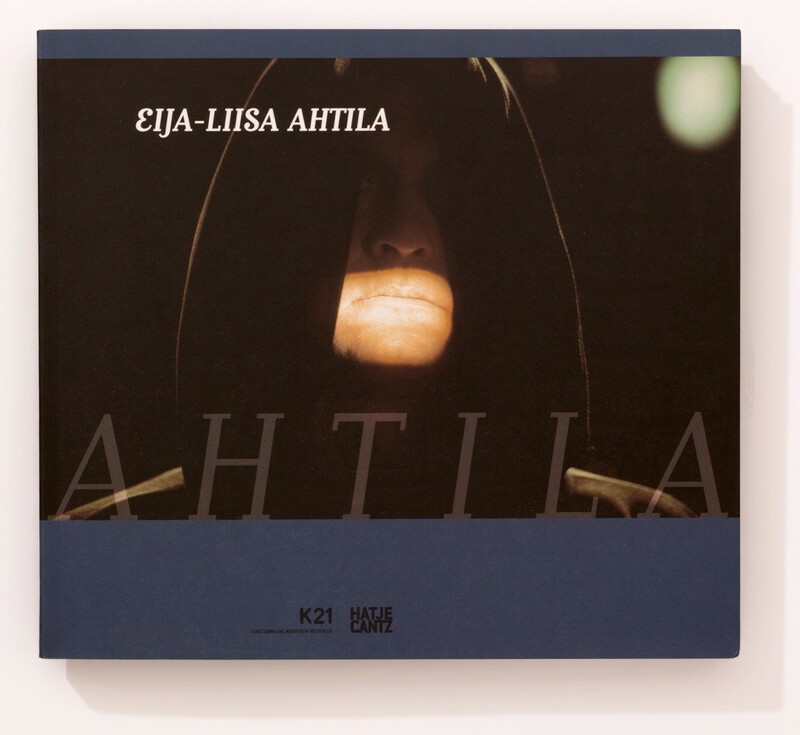 Eija-Liisa Ahtila approaches death from multiple temporal and spatial perspectives and different voices, zeroing in on an event, for which no image and no words can be found. In so doing, she renders visible that, in all its certainty, death remains outside clear categories. It is nowhere, because it is only a gap, a cut, a transition between the living body and the corpse, a before (the painful fear or the serene anticipation of the person about to die) and an after (the mourning and memorial of the survivor). Its intrusion into the everyday occurs from an ungraspable point, outside all relatable experience, lacking any empirical object. Nevertheless we must respond to death,must make sense of it, must assign to it a place in our quotidian lives, even if we can do so only in the form of a belated recapitulation of its occurrence. Because death is the one privileged moment of the real, we can speak about it only through highly formalized, figural language, foregrounding its break with mimetic representation. At the same time, it must find closure, so that we can move back into the reality of the everyday. The last shots of Today return to the site where the accident occurred, while the voice-over of Vera explains that they planted a small silver spruce by the side of the road. The day has re-asserted itself.We are in the present, together with the traces death has left there,marked by this memorial. Today serves as a useful departure not only for the way Eija-Liisa Ahtila herself repeatedly returns to the theme of mourning and commemoration, but also how she insists on a rigorously formalized enactment of the loss death affords and the recuperation it requires, because, in so doing, she addresses the seminal aporia inherent to any aesthetic engagement with death. By having recourse to a mode of visual story-telling that foregrounds a simultaneity of perspectives, even while realistic depictions flow seamlessly into hallucination, Ahtila points to the fact that, non-negotiable and non-alterable, death is the limit of ordinary language. It is a disruption of our image repertoire, even as it has always elicited a plethora of aesthetic representations. As the point where all language fails, death is also the source of all aesthetic formalization. Precisely because any representation of death is self-consciously non-mimetic, it also points to the real beyond quotidian reality, evoking the referent that narratives may point to but not touch. For the survivor it is a speculation,a spectacle,and a specter. Yet if death’s after-effects invariably haunt us, stories about it also serve to protect us against the survival of its power in quotidian life. As we recapitulate the events leading up to and following upon the demise of a loved one,we come once again to orient ourselves in the world of the everyday, learn to reaffirm its laws. We need narratives about our survival, even if we realize that the event of death evades them. Having prompted our account, it exceeds all language of recuperation,because all stories about death come after an event the survivors who speak experienced only by proxy. If, therefore, as Eija-Liisa Ahtila has explained about her appropriation of the medium of cinema, she seeks to find“moving images of stories that have already happened,” the issue of the belatedness at the core of her work proves to be particularly poignant when viewed in conjunction with her thematic interest in death.The images she creates not only explicitly return to the past, and return this past to the present.They are also moving in a two-fold sense. On the one hand they perform a movement in time, corresponding to the manner in which death is a temporal process. After all, the fragility of our mortal existence expresses itself in the fact that life is temporally limited. Living means moving towards death, whether we actively pursue it or not. On the other hand, to speak about moving images meant to recollect and perhaps even overcome events that have already occurred, also invokes their affective quality. The effect of death is that it appeals to us emotionally as no other state does. Yet by breaking open ordinary categories of time and space, death also displays a curious proximity to the work of cinema. Indeed Jean Cocteau once compared making movies to watching death at work. Cinema is a medium that unfolds as a sequence of time, twenty-four images per second, much as death expresses itself through time. Each second, for which in cinema we might have twenty-four images, it comes closer, approaches us,who are still living. In her self-conscious enactment of moving images of stories that, because they have already happened, invariably have death inscribed in them, Ahtila, however, takes the correspondence between death’s work and that of cinema further than Cocteau intended it. While her narrators perform confessions of stories that move them, the narratives she enacts, by using multiple screens and a disjunction between the image we see and the voice we hear, juxtapose different times and different spaces, real and imagined. By offering comments on themselves, her narrators enact for us the split between a person experiencing death and the one recalling this experience. They move us, even though, or perhaps because, there is a distance between the event and their narration. The scripted words, the montaged images, and the occurrence they recall are not together, yet are conjoined by the death which has no fixed place, no clear category. Disembodied, the voice of the narrator may at times appear to be spectral. Voice-less, the face of one of the players in the story may seem particularly haunting, as though marking the return of somebody who no longer is. In all cases, however, bringing onto the screen an event that has already occurred, so as to record, and in so doing recuperate something lost, invariably invokes the loss itself. This is the ruse subtending Ahtila’s cinematic work with death. The narrator then moves to the actual confession. She faces us, as on a stage, so as to recollect the past, even while offering an account of herself. Returning to the situation leading up to the event of death, she describes how, during the Easter holidays, she decided to walk with Luca along a lake close to her country cottage, where the sun had begun to melt the snow. Interspersing realistic images of the landscape, awakening to new life, we see the narrator on stage, enveloped by darkness, frozen into the pathos gesture of the bereaved, as she remembers the moment when Luca broke his leg. The story then moves to images, documenting the x-rays, the operation and finally the diagnosis of a fatal bone cancer. “On that day, death entered the house,” the narrator explains, falling into what Joan Didion has called the magical thinking death induces. Seeking to express the guilt her own survival has called forth in her, she goes on to confess, “I prayed that we could keep Luca Boy at least for the summer, and then later, when Luca died on the 11th of August, I blamed myself for not praying to have him at least until Christmas. ”What follows are images of the surroundings she used to share with her dog, colored by the presence of death; an undoing of world, in which the loss of her companion corresponds to her psychic numbness. Her home is empty, the landscape outside is once more covered in snow and ice. Both function as metaphors for the withdrawal from life her state of mourning requires. Yet, as all rituals of mourning insist, a recuperation of life must occur. Sitting once more on the dark stage and giving an account of her mourning, the narrator mentions the Finnish artist residence in Benin,West Africa,where she was able to procure a place for herself. As her story moves to its final location, the Manhattan snowstorm, with which The Hour of Prayer began, is both recalled and transformed. Having left the snow-covered landscape surrounding her country cottage in favor of a hot African November, the story once more shifts from images of a bustling city center to the intimate solitude of a bedroom, and with it from day into night. Yet a significant transformation has occurred, placing the emphasis on waking up from mourning into the dawn of a new morning. The narrator recalls that across the road from her residence was a Catholic church, where early every morning, when it was still dark, bells began to ring at the break of dawn. She comes to think of the dogs’ howling, which accompanies the sound of this bell, as a collective canine prayer. This ritualized awakening of her surroundings offers a figural enactment of her waking up from the experience of death. In contrast to the sequence with which The Hour of Prayer began, she does not remain in bed, restlessly tossing and turning. Instead, having gotten up, she walks onto another dark stage, the formalized site of her confession, so as to sing her “small song.” In so doing, she moves beyond her prophetic nightmare and its traumatic realization into the morning after, invoking her grief even while staging an exuberant triumph over loss.The space of her performance remains enveloped in darkness,but, framing it on the left and the right, images of a morning in Benin eventually appear. When her song is done, these come to replace even the close-up of her face.Turning grief into a song prompts a screen filled with four images of a new day, to signal a successful translation. As cultural anthropology has shown, death is conceived as a wound to the community of the living. Rituals of mourning thus fall into two phases. Initially the bereaved survivors enter into a liminal phase, separate from everyday life. Then, in a second phase, society reasserts itself by symbolically reintegrating the departed. It replaces the dead body with a tombstone, and in so doing exchanges the actual corpse with a commemorative image and text. These rituals thus work with the assumption that death is a regeneration of life. In his discussion of the psychic aspects of mourning, Freud in turn has suggested that the second, liminal phase resembles melancholic psychosis. In response to the loss of a loved one, the survivors not only cling to the departed, unwilling to give up their psychic investment in what is gone. Rather, because the mourner fantasizes that what, in reality, is lost continues to be present to her, her perceptions of her surroundings come to be overflooded by hallucinations. In Consolation Service, Eija-Liisa Ahtila uses the tripartite structure of rituals of mourning as the driving metaphor for her visual narrative about a divorce. The film begins with a narrator explaining that she is writing a story about a couple that has decided to split up. “It is a story about an ending,” she explains, in three parts. The first, showing Anni and J.P. visiting their family therapist, sets the stage for the death of their marriage. In the second, the separation they desire comes to be realized. After celebrating J.P.’s birthday in the home of one of their friends, they embark on a fatal nocturnal walk across the frozen lake.As the ice breaks, all of them fall into the freezing water. The hallucinatory images of Anni, a Shade, floating beneath the water’s surface in an aquatic Hades, accompanied by both her voice-over and that of the narrator, describing the state of timelessness and limitless place, visualize divorce as death. The disregard and loss of love Anni had come to experience in her marriage is now embodied by images of J.P. floating past her. They have lost all contact. In death each is alone. Yet, like all tales of mourning, this story about an ending also requires a third, recuperative phase. Anni, alone at night in her living room while watching over her sleeping child, suddenly hears someone entering her home. Her grief over the separation from her husband has produced a state of over-vigilant psychosis. No longer able to distinguish between hallucination and waking perception, she believes the departed has returned to her. Twice J.P., magically reappears before her, but as she tries to grab him, he begins to shrink and finally dissolves into specks of dark color, as though the film image were falling apart. Then Anni, realizing that this specter has a message for her, simply faces the man, who is dead to her, and as he bows before her she imitates his gesture of respect.With this acknowledgement of his separateness from her she releases him, in what the narrator asks us to read as “a kind of consolation service.” The psychotic presence of a lost husband can now vanish completely. But at the beginning of this last scene, Ahtila’s camera had already drawn our attention to a photograph of the couple, from the time they were still happy together, standing on the table next to the couch. This quotidian image of the departed, commemorating a past union, will remain even after the hallucinated return of a deadman has come to an end.Thus, even as Consolation Service, in its equation of divorce and death, enacts the process of closure and recuperation all rituals of mourning require, Ahtila sets the stage for a sustained haunting on the level of the visual traces left on the screen. In so doing, she not only acknowledges the ubiquitous work of death in the midst of life, but also at the heart of her appropriation of the medium of cinema. In all her moving images of stories that have already happened, the hallucinations she records draw the spectator into the liminal realm between life and death, between the occurrence of death and its ultimate recuperation. If the event of death functions as a disruption of the ordinary, which in turn prompts the bereaved to talk about their relationship to the dead, the liminal phase of mourning,which corresponds to their time of confession, must come to an end, so that the everyday can successfully reassert itself. Yet, the moving stories Ahtila constructs around these confessions, implicitly sustain the antagonism between the reassurance that, in the end, the everyday will assert itself against death, and a recognition that death irrevocably leaves its traces. After all, the cinematic image and the narrators’ voices are nothing other than traces of something that has already happened even while the film has magically been made present again. The medium of cinema thus itself dictates that all efforts at recuperation are fragile. As she patches together fragmented narratives, exploring the event of death from different perspectives, Ahtila’s idiosyncratic use of the cinematic medium renders visible that the regained order is riddled with disruptions, gaps and disjunctions. Her work with death self-consciously thrives on the proximity between the fabrication of a psychotic reality and the fabrication of cinematic images. Her newest film Where is Where? takes the speculation that death, while ubiquitous, has no fixed place as its point of departure. In this story about the killing of a young French boy by his two Arab friends during the Algerian civil war, different times and places flow together, fracturing each other. To the female poet, whose vision is necessary to commemorate this fateful event, death appears at night, a man dressed in black, his face painted white. Yet he doesn’t enter her house until the next morning, as her two sons leave for school, and he does so to boot, because he needs her to give him some words. In response to her question why she should do this, he replies “so you can construct this time after death by being in these words.” Yet the hallucination her poetic gift calls forth, moving back into the past, making it present again, also serves to disorientate the present. Her work of death is nowhere, between Europe and North Africa, between the late 1950s and the present. But she also hovers between her personal attempt to understand the events she wasn’t a witness to and the actual occurrences of death, the massacre of Algerians by the French and the revenge of the two Algerian boys. Because her words are irrevocably separate from this particular incursion of death,we remain in the realm of a spectral speculation,which disrupts the stable order of the everyday even while seeking to offer a complex memorial to all the violent deaths of the past. Death opens a space where the personal becomes impersonal, as the deceased transforms into an image, which can be appropriated by someone living somewhere else,at a different time.This is also what the medium of cinema does. It records the work of death not only by foregrounding the ephemerality of existence. As Ahtila’s poet enters a virtual realm of images, where her introspection transforms into a projection, generating the cinematic narrative Where is Where?, her work with death obliterates all reference to any fixed space. The words Ahtila and her poet give to death refuse to fix its meaning. They neither judge, nor do they seek to forgive. Instead they respectfully bow before death, rendering visible that the drive towards death has sustained our history as poignantly as any pursuit of survival. As we are faced with this work of death,we, too,are drawn into nowhere,where the past and the present, the other and the self, the real and the fantastic, shere timelessness and time meet – for the brief, fleeting and fragile moment of our viewing. 1. Sigmund Freud (1930), Civilization and its Discontents. Standard Edition XXI (London: Hogarth Press, 1961), p. 77. 2. Maurice Blanchot, translated by Lydia Davis, The Gaze of Orpheus and other Literary Essays, Barrytown: Station Hill Press, 1981, p. 79. Blanchot,Maurice. The Gaze of Orpheus and other Literary Essays. Barrytown: Station Hill Press, 1981. Bronfen, Elizabeth. Over Her Dead Body. Death, Femininity and the Aesthetic. Manchester: Manchester University Press, 1992. Deitz, Paula.“Women on the Verge of a Very Finnish, somewhat Cubist Breakdown.” The New York Times, October 2, 2006. Didion, Joan. The Year of Magical Thinking. New York: Vintage, 2007. Freud, Sigmund (1917). “Mourning and Melancholia.” Standard Edition XIV. London: Hogarth Press, 1957. Freud, Sigmund (1930). Civilization and its Discontents. Standard Edition XXI. London: Hogarth Press, 1961. Taubin,Amy. “Straight out of Finland Comes a Brand-new Vision.” Film Comment (September–October 2002).